The English Trade Union Congress’ battle bus will be driving around Whitehall, Westminster and Parliament Square at 9.00am, tomorrow, the 3rd March 2017, playing the derisive “Lion and the Unicorn” nursery rhyme to help “Drum them out of Town”! Both the People and the elected House of Commons, with overwhelming majorities, voted to trigger Article 50 of the Lisbon Treaty. Now it would appear that certain unelected Lords are putting forward amendments to frustrate the democratic “Will of the People”. This must not be allowed! These Lords are putting their own unelected views above the Brexit referendum democratic result. 13 Comments on "Abolish the House of Lords! 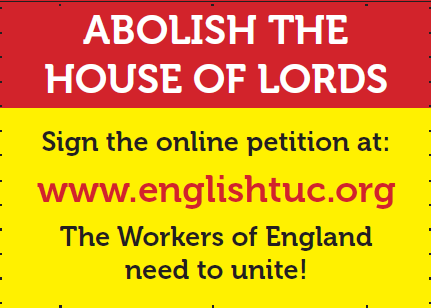 The English Trade Union Congress’ battle bus will be outside the House of Lords tomorrow – campaigning to abolish the House of Lords!" Did you have any issue with the House of Lords before they mildly threatened your cherished Brexit? I don’t recall anything on the vote form regarding existing EU nationals remaining in this country? I cannot understand why we have so many members compared to other countries like the U.S.and feel that we could have a quarter of them,or fewer .They do not deserve the allowances they receive as they often do not attend or speak and much needed money could be saved. Most members are from privileged sections of society and for them to try to stop what the people want is unjust. The House of Lords is an affront to democracy which we have been trying to get rid of for over a hundred years and it’s about time this anachronism was consigned to the rubbish-bin of history. The House of Lords is a Gravy Train with 800 passengers. get rid of the old boys club as soon as possible – it should be cut to about 50/60 members all to be with business background leaders of industry and to be elected by the public. we need some brains not boozers and free loaders. The money they are costing would be better spent elsewhere. One of the main reasons we are coming out of the EU is because our laws are controlled by unelected bureaucrats in Europe so why should we tolerate the same situation with the House of Lords in this country. Why do these unelected buffoons still seem to think their privileged position gives them the right to change the will of the people? Time to show them the door. A total waste of space and money which definitely should be abolished.